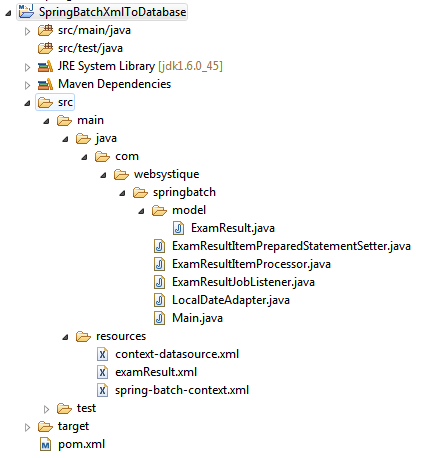 In this post we will learn about how to use Spring Batch to read an XML file using StaxEventItemReader and write to MySQL Database using JdbcBatchItemWriter. We will also witness the usage of JobExecutionListener and itemProcessor. Let’s get going. What we will do here is read the XML file (src/main/resources/examResult.XML) and write it’s content to MySQL database. As we need to interact with db this time, we will use spring-jdbc support. Since we need to handle XML, we will use spring-oxm marshalling support. To interact with MySQL, we need mysql connector, and since we are also using joda-time for any date-time processing we might need, we will include that dependency as well. Below is the input xml whose data we will be saving in MySQL database. ItemProcessor is Optional, and called after item read but before item write. It gives us the opportunity to perform a business logic on each item.In our case, for example, we will filter out all the items whose percentage is less than 75. So final result will only have records with percentage >= 75. Note that since we are using Joda-time LocalDate which can not be mapped to MySQL date directly, we need to provide custom-logic to handle this conversion.Below is the class for this conversion. As you can see, we have setup a job with only one step. Step uses StaxEventItemReader to read the records, itemProcessor to process the record & JdbcBatchItemWriter to write the records in database. commit-interval specifies the number of items that can be processed before the transaction is committed/ before the write will happen.Grouping several record in single transaction and write them as chunk provides performance improvement. We have also shown the use of jobListener which can contain any arbitrary logic you might need to run before and after the job. 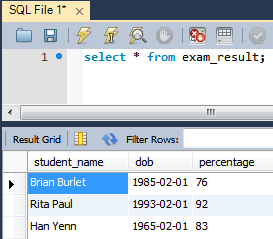 And finally, check the EXAM_RESULT table in database.Below is the snapshot from database after this job. Records are saved in database. You can see that records with percentage less than 75 are missing, thanks to ItemProcessor filtering.